Vaccines and safe water, sanitation, and hygiene (WASH) interventions prevent not only typhoid, but a multitude of other diseases as well. 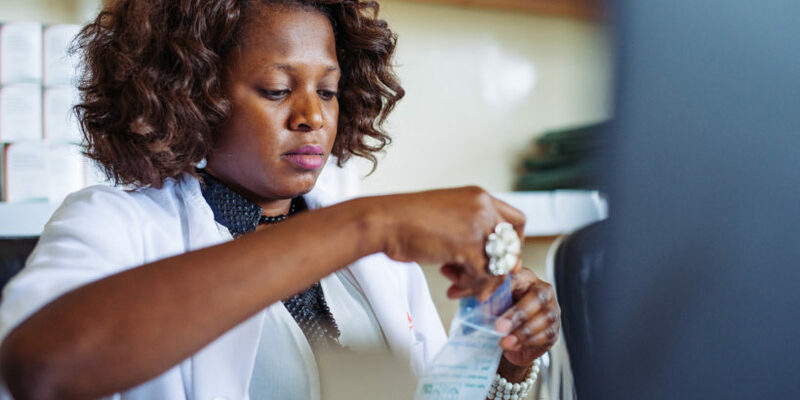 Health workers and advocates often work to combat many different diseases at the same time, underscoring the importance of how other diseases, issues, and interventions relate to typhoid prevention and treatment. Extensive research shows that proper nutrition not only promotes children’s growth and development, it also promotes a healthy, strong immune system. Although there is insufficient data linking typhoid to malnutrition, well-nourished children with strong immune systems are better able to fight infections and are less likely to suffer long-term health impacts. Well-balanced nutrition—with appropriate and adequate vitamins and minerals—is important to boost children’s immune systems and keep them healthy, even when they are susceptible to or suffering from a typhoid infection. Nutrition has an integral role in taking on typhoid with comprehensive and integrated approaches. Typhoid, caused by the bacterium Salmonella enterica serovar Typhi, is closely related to a similar disease called paratyphoid, caused by Salmonella enterica serovar Paratyphi. Akin to typhoid, paratyphoid is passed to humans or animals through water and food contamination. The US Centers for Disease Control and Prevention (CDC) estimates that 6 million cases of paratyphoid occur each year. Currently there are no vaccines available to prevent paratyphoid fever, although there are conjugate vaccine candidates under development for paratyphoid fever alone and as combination vaccines for typhoid and paratyphoid. Additionally, improvements in WASH help prevent both typhoid and paratyphoid, as well as other waterborne diseases. Another related illness is caused by different, nontyphoidal Salmonella enterica strains. These strains are a leading cause of invasive nontyphoidal Salmonella (iNTS), a leading cause of bacterial diarrhea worldwide. According to the CDC, iNTS is estimated to cause 94 million cases of gastroenteritis (vomiting and diarrhea) and 155,000 deaths globally each year. In particular, iNTS is a major cause of bloodstream infection in sub-Saharan Africa among young children suffering from malaria and malnutrition, as well as among HIV-positive adults. Much like typhoid and paratyphoid, those with iNTS do not have distinctive symptoms, making proper diagnosis and treatment a challenge. Currently, there are no vaccines for iNTS, but research for a broad-spectrum iNTS vaccine is under way. Typhoid and paratyphoid are known as enteric illnesses because they are caused by an intestinal infection. Other enteric illnesses include polio and diarrheal disease—which can be caused by rotavirus, Shigella, enterotoxigenic E. coli (ETEC), cholera, iNTS, and a number of other pathogens. All enteric pathogens enter the body through the mouth via contaminated food, water, or hands. Because these diseases are spread in the same way, they share many of the same tools for prevention, including vaccines, exclusive breastfeeding and nutrition, and improvements in water, sanitation, and hygiene (WASH). By integrating typhoid prevention and control with efforts to take on diarrheal disease and other enteric and childhood diseases, we can multiply our impact on child health.